Originally known as Beverley Hills, we competed in the Victorian Amateur Football Association between 1972 and 1981. The club was not successful in procuring a premiership, but did reach two grand finals, going down to West Brunswick by 98 points in F Section in 1976 and by 4 goals to AMP Society in E Section three years later. The 1982 season saw Beverley Hills commencing in the Eastern Districts Football League where we have remained ever since. 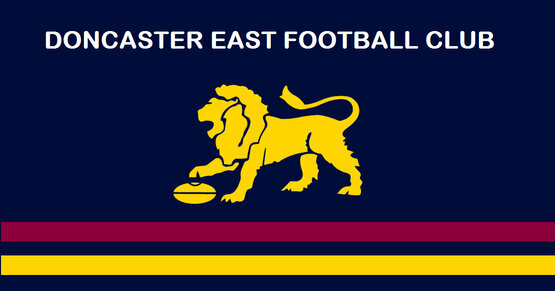 In 1989 the club altered its name to Doncaster East, and four years later absorbed the Wattle Park Football Club. This latter move coincided with a significant upturn in the club’s on field fortunes culminating in a resounding 21.17 (143) to 8.7 (55) triumph over Upper Ferntree Gully in that season’s division four grand final. In recent seasons we have performed well. The seniors claimed their second flag in 2007 when they overcame Boronia by 64 points in the division three grand final, and in 2008 they consolidated in division two with a 9-9 record and a mid-table finish. Meanwhile the reserves enjoyed back to back division three premiership triumphs in 2004 and 2005. In 2010 we played our first Division 2 final losing to Montrose. In 2012 our U19's won the Division 2 flag defeating Upper Ferntree Gully.